Great flexibility and adaptability to the requirements and operation modes of utilities. Supports all standard protocols: IEC61850, IEC60870-5-104, DNP3.0, DLMS, IEC60870-5-102, Modbus. iRTU devices can be used as substation gateways, RTUs or BCUs (Bay Control Units). 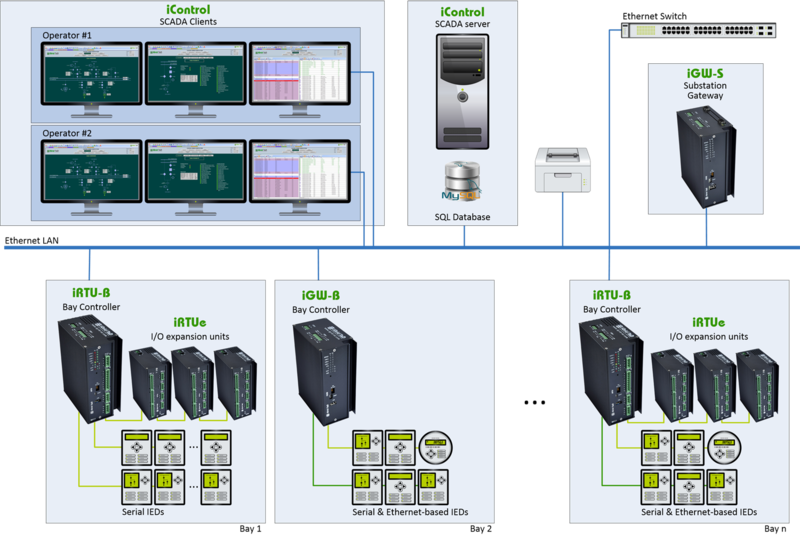 iControl is an easy-to-use substation SCADA able to work in standalone, client/server or redundant modes. Substation automation represents one of the basis of the Smart Grids definition, as a key point on controlling the distribution network, hence the complete grid stability. Grid automation evolved immensely in the past decade, from the old centralized RTUs based on big I/O quantities to the newest distributed IEC61850 systems which definitively introduce IP technology on the substations. iGrid T&D solutions are designed for both, new substations and retrofitting projects; i.e, projects where old substation automation systems should be connected to newer control centers with IEC60870-5-104 or DNP3.0 over TCP, or where new IEDs should be added (like IEC61850 protection relays). Powerful and reliable substation gateway that supports most standard protocols such as IEC60870-5-101/104, DNP3.0, and IEC61850. It is equipped with an embedded Ethernet switch. Smart, modular, and scalable BCUs (Bay Control Units) which support standard protocols including IEC61850, IEC60870-5-104, DNP3.0, Modbus, DLMS, etc. Available with internal I/O modules (iRTU-B series).